Elder Hilbig’s feelings about Church service began their development in his childhood. He was born on 13 March 1942 in Milwaukee, Wisconsin, to Karl and Mildred Hilbig. The example that his parents and other members set in accepting callings was a key factor in his spiritual development. Watching them serve, he recalls, shaped his attitude toward the Church and spiritual things. Elder Hilbig served as a full-time missionary in the Central German Mission, then went on to receive a bachelor’s degree from Princeton University and a law degree from Duke University. After working as a trial attorney in Los Angeles, he established his own firm, then in April 1998 became International Legal Counsel for the Church. In that capacity he presently works with the Europe West and Europe Central Areas. 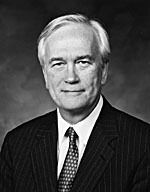 Prior to his call to the Second Quorum of the Seventy, Elder Hilbig was called in 1995 to be an Area Authority and in 1997 to be an Area Authority Seventy. He has also served as Gospel Doctrine teacher, Young Men president, elders quorum president, bishop, stake president, and president of the Switzerland Zurich Mission.